Tonight at 8pm I moderate the no doubt spectacular debate on immigration at Muchmore’s, near the first subway stop into Williamsburg on the L subway line. •Manhattanites often comment on how old and unhip they feel as soon as they glimpse the Williamsburgers, but there are times when it can make the visiting Gen Xer feel a reassuring sense of superiority, as when I recently overheard confused young hipster males in a bar there having a conversation about whether (formerly NYC-dwelling) singer Joe Jackson is the father of Michael Jackson. 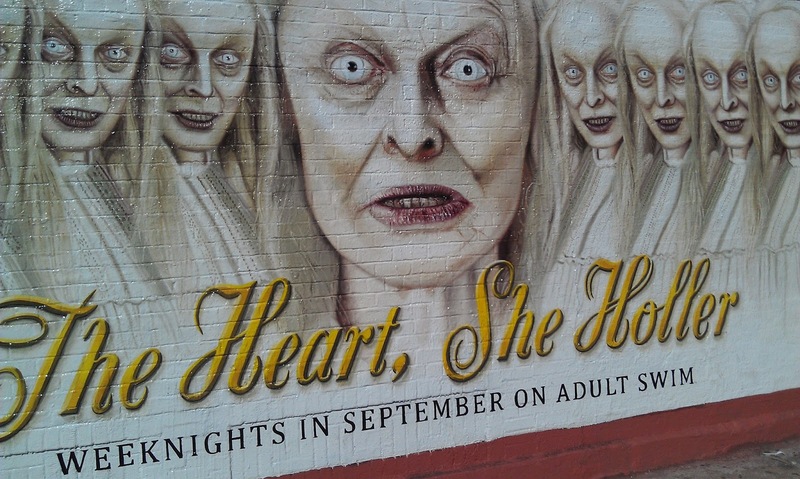 •Nearby you see the wall-sized outdoor painted mural advertising the David Lynch-esque, late-night, surrealist comedy/horror series The Heart, She Hollers that I saw in Williamsburg, which gives you some idea how different the (apparently crucial) young-hipster demo is there from the average billboard-gawker out in the suburbs. •I have found some Manhattanites paranoid that they will be trapped on the other side of the river if they dare trek to Williamsburg (this has happened about twice in the past 7,000 years), but I will admit I ran into one very unexpected transportation problem the last time I was there: For the first time, a Metro Card machine just plain ate my $20 and gave me no card. •On a brighter note, that same trip to Williamsburg (to print out flyers advertising tonight’s debate) gave me a chance to further distance myself from the old comics-collecting habit a bit by giving three comics away to young folk hanging out at Muchmore’s (admittedly, I had already read them). I hope their relative inexperience doesn’t mean that the special 3D cover on the issue about Darkseid will cause nausea. Even for those wearied by or long wary of DC and Marvel superhero stuff, with whom I fully sympathize, there is the amazing comic book miniseries The Star Wars from Dark Horse (who so richly deserve to keep the Star Wars comics franchise after all these years despite synergistic Disney now owning both LucasFilm and Marvel). The Star Wars is a trippy comic book adaptation of George Lucas’s original 1974 draft of the Star Wars screenplay, with all sorts of familiar elements (including some that he wouldn’t get around to using on-screen until the prequels) but all scrambled around and put in different places. There’s an aged Gen. Skywalker, and Anakin is a separate character from Vader, and Alderaan is the capital of the Empire, and all sorts of other surprises that make it a weird but essential mirror-mirror experience for completist Star Wars fans. That one I kept even after dispensing the other comics to the hip young masses at Muchmore’s. •And speaking of the UK, Williamsburg, and immigrants, here, courtesy of the great Bananarama, is what NYC culture looked like to British eyes back in 1982, what with Boss Hogg chasing people all over Brooklyn. Our rock videos about them were, of course, all full of bobbies drinking tea back then, I admit.